Besides, M777 American Ultra Light Howitzers and the K-9 Vajra, the third gun system inducted is the 'Composite Gun Towing Vehicle' for towing some of the existing guns in service with the country, while K-9 Vajra is a self-propelled artillery gun. 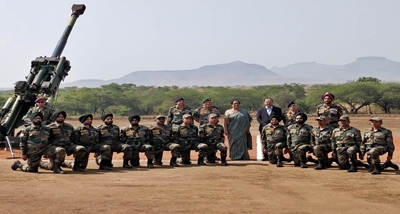 The induction ceremony here comes ahead of establishing the first regiment- each comprising of about 18 guns- of the M777s and the Vajra by around mid-next year. For procuring 145 M777s, India in November 2016 had entered into a contract with the United States under the Foreign Military Sales programme for 5,070 crore rupees.